On a beautiful Fall morning, we headed off to see what the day held. We needed a caffeine fix to get us started. This made the decision of our first stop simple. We had seen a lot of social media buzz about a new coffee shop in the Strawberry Hill district. As we exited I-70 onto Central Avenue, we could already see the cars lining the street in front of Splitlog Coffee. ​The name refers to Mathias Splitlog, who we learned about during an earlier visit to the Strawberry Hill Museum. As we pulled up to the small shop at 548 Central Ave., we were lucky enough to snag a spot right in front. As we stepped through the door, the intoxicating aroma of the espresso and baked goods. A handful of tables dot the interior, as well as a long counter that offers great window seating. The menu at Splitlog Coffee Co. is basic. 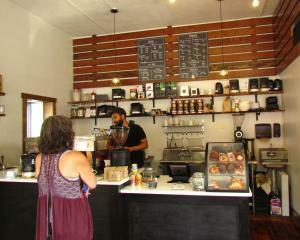 They offer drip brew made with beans from a local roaster, as well as some specialty espresso drinks. We ordered a couple of lattes, and noticed the baked goods from Sunflower Bakery. A couple delicious looking pastries were added to our order, and we grabbed a seat while our drinks were prepared. 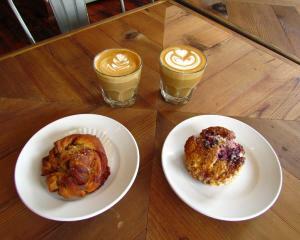 The barista whipped up our items in no time, and they were a delicious treat for our eyes, as well as our palates. With our appetites satisfied, we bid our farewells, and headed to our car. As we pulled away, we made note of the drive-thru option for future stops on our way downtown. Our next stop was not far, and within a couple of minutes we pulled into the parking lot of Krizman’s​ ​Sausages​. This KCK landmark is located at 426 North 6th Street. This third generation, family owned business began in 1939, and has served the Strawberry Hill community since its early days. As time passed, the word of their high-quality meats spread, and now they ship to customers around the country. 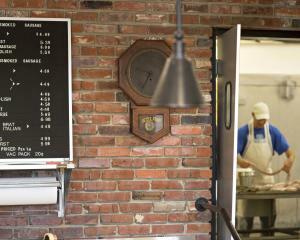 These days their products are featured in many of the best barbecue restaurants in the region. We had the pleasure of talking with Joe Krizman III, who gave us some background on the company. While we had hoped to arrive on a day when they were making the sausages, this only happens on weekdays. 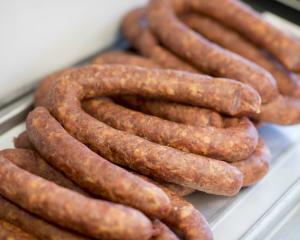 Krizman’s is not like the normal meat market, which makes sausages to use up spare cuts of meat. At Krizman’s they focus specifically on sausages, determined to make the best product available anywhere. Since we had plans for another stop, we decided to come back later to pick up some of their sausages to cook up at home. Back in the car, we pointed ourselves westward, and headed to the Muncie area of town. Our travel took us along K-32 Highway, which follows the Kansas River. Standing on a hill overlooking the river, we came to Grinter​ ​Place Historic Site. This ages old home, located at 1420 S. 78th Street, was completed in 1857. 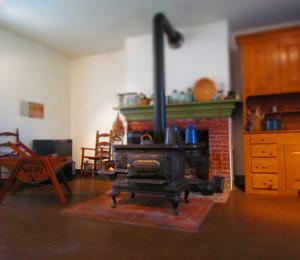 Home to Moses and Annie Grinter, who operated a trading post and ferry. Quite often their ferry was used by U.S. Calvary troops to cross the Kansas River during trips between Fort Leavenworth and Fort Scott. 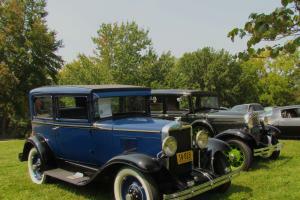 Our visit happened to occur during their annual Summerfest, so the place was packed with vendors, character actors, food booths, and a car show. On the porch, which is the back of the home, the Grinter Quilting Bees were busy creating a hand-stitched masterpiece. Nearby, a costumed gentleman played old-time ditties on his guitar. We ran into Bill Nicks, a local re-enactor, who was in character as Moses Grinter on this day. 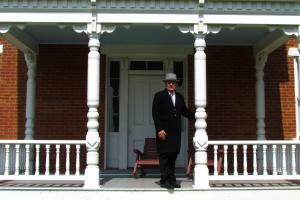 After he gave an introductory speech to the crowd, we convinced him to pose for some photos at the front of the house. The main purpose of our visit was to see the home of the Grinters. We made our way around to the back porch, which is where the tours begin. 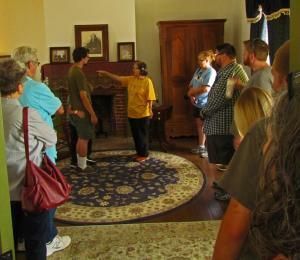 Due to the larger than usual crowds, the tour was a continuous circuit, and we joined in while they were in the kitchen. As were walked through the oldest home in KCK, we thought about the difficulties that these early pioneers must have faced. The house is well built, which is obvious, since it still stands 160 years later. The idea that this family sat out on the open plains, with no one for miles, just amazes us. In these modern days, it is easy to forget how these early settlers would have had to fend completely for themselves. As we stepped out on the second story balcony, we looked out upon the Kansas River, which meanders constantly toward the east. Our day of newest and oldest was ending, but we knew the memories would remain for many years. Tags: Grinter Place Historic Site, Krizman&apos;s Sausage, Splitlog Coffee Co.
Jeff and Crystal of Our Changing Lives Blog, are Baby Boomers who love to explore this amazing world around us. 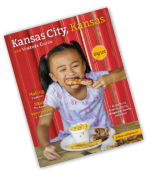 Being based in Kansas City, many of their visits are focused in the center of the U.S, although they also like to take the occasional longer journey. While jetting away to various exotic locales can be intriguing, they still prefer to travel by automobile when possible. This allows them to investigate all the nooks and crannies, and root out those hidden gems. While they love to read about backpacking through Thailand or cliff diving in Mexico, sometimes they just want to know about things closer at hand. 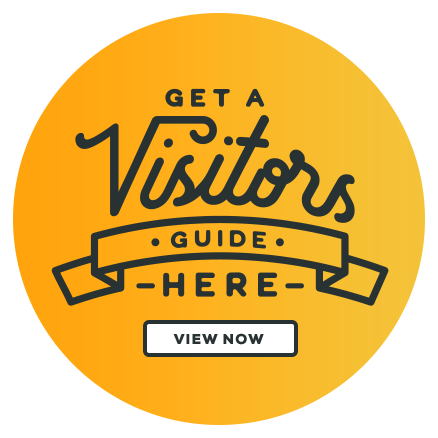 Perhaps you are looking for a great weekend day-trip, a nearby museum or just a place to catch a bite to eat. That's the kind of things they'll be focusing on. Jeff and Crystal will share with you their insider experiences, honest opinions and easy to use reference for your own travel plans.